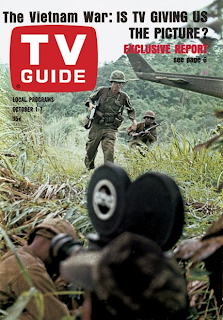 For the first time, the stain of the 1960s - Vietnam - graces the cover of this week's TV Guide. 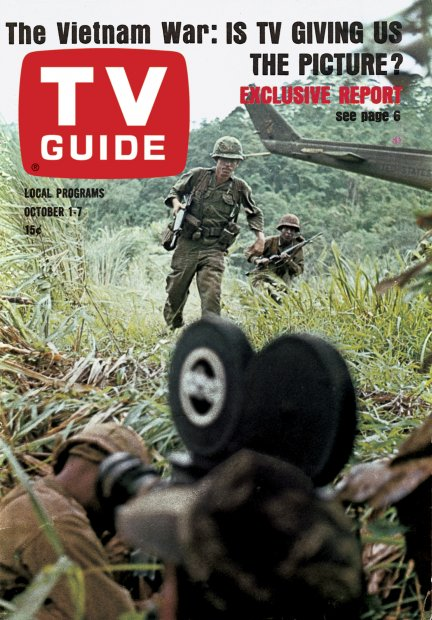 Neil Hickey, TV Guide's New York Bureau Chief and author of some of the best news features published by the magazine, presents the first of a four-part series on how - and how well - television is covering its first war. It is a war "exorbitantly more demanding, both mentally and physically, than anything those earlier newsmen faced in Europe or the Pacific." It's a guerrilla war, replete with everything from jungle disease to ambush land mines and booby traps, field telephones that barely work, and as one correspondent puts it, "pushing the cause of journalistic profanity to new horizons." As NBC's David Burrington puts it, "There are so many imponderables and ironies here that it's sometimes difficult, if not downright impossible, to explain what's happening in terms that an American audience will understand." Cameramen lug their equipment around in temperatures approaching 130, walking over 17 km only to find that an outpost had already been wiped out or a Vietcong squad disappeared, and wind up with less than a hundred feet of footage. Newsmen tell the story of a press conference called by Buddhist leaders in Danang, in a room with 35 dead bodies piled up in the corner. Soon, it became apparent that there would be no press conference, that the newsmen themselves were being held as hostages. They were able to escape in the ensuing firefight between government and rebel forces. Other times journalists aren't so lucky, and though none have been killed yet, several have suffered serious wounds. ABC's Lou Cioffi speaks for many when he says, "You begin wondering when the law of averages will catch up with you. I'm scared all the time, but I'm more scared now than when I first came out here. TV has nothing in its history to prepare it for this kind of story." So why does the network correspondent put himself through such hell? After all, they've all volunteered; no newsman is ever assigned to Vietnam. "Let's be truthful," a young journalist says. "We're all war profiteers. We know that if we prove ourselves here we can short-cut our careers by five to 10 years. Here in Vietnam you can get your face on the network news three or four times a week. That's more than you can do in the United States. It's risky, but it's money in the bank." CBS' John Flynn adds, "This is where it's happening, and I see no reason to be anywhere else." And soldiers like having the newsmen around, at least at this point; "To them," an ABC newsman says, "it means somebody really cares about what they're doing. They'll share their last C-ration with you, and tie down your poncho tent properly so it doesn't blow away. I have never felt more appreciated, nor more humble." That comment about "somebody really caring" - for some reason, that makes me tremendously sad. Is that Vietnam in a nutshell, or what? As I mentioned, this is part one of a four-part series; next week's will deal with the battle between the networks for ratings and exclusives. Looking at the glorified fan-mag that TV Guide has become today, it is difficult to imagine the magazine could come up with anything this serious, this newsworthy, nor would they want to. But to the TV Guide of this era, television was a serious business, covering serious news, and deserved to be written about and covered in a serious manner. For that matter, it's hard to imagine any of today's celebrity-driven newsmagazines (or is that "news" magazines?) producing a story as substantial as this. My, times have changed, haven't they? Hollywood Palace: Elizabeth Montgomery of "Bewitched" makes her debut as a Palace hostess and her first network appearance as a song-and-dance gal. Guests: singer Vic Damone; comics Paul Lynde and Jackie Mason; the Baja Marimba Band; Pat Anthony's tigers; and two acrobatic acts, Sensational Parker and the Three Robertes. Sullivan: Ed's scheduled guests are Jimmy Durante; Dame Margot Fonteyn and Rudolf Nureyev, who appear in segments from the filmed version of Prokofiev's ballet "Romeo and Juliet"; comic Alan King; singer Connie Francis; Gwen Verdon and cast members from "Sweet Charity," who perform "The Big Brass Band"; ventriloquist Arthur Worsley; and the winners of the New York Harvest Moon Ball dance contest. This is actually a pretty strong week for both shows, but Ed has, I think, just a little more class. Nureyev and Dame Margo were two of the most famous ballet dancers of the time, and their appearance - even on film - would have been a highlight for many people who wouldn't get to see them otherwise. Durante and King are always funny, and Gwen Verdon likely danced up a storm. No backing into it this week, but Sullivan's the clear winner. You'll remember how last week I said that TV Guides of this era covered live events with a combination of up-to-the-minute and to-be-announced? Well, this week's edition demonstrates that in spades. The World Series begins Wednesday, with the runaway American League champion Baltimore Orioles taking on - who? At this point, your guess is as good as anyone's, with the Dodgers, Pirates and Giants locked in a three-way battle for the flag. The weak-hitting Dodgers, defending Series champions, are led by Sandy Koufax (in his last season) and Don Drysdale; the slugging Pirates feature future Hall of Famers Willie Stargell and Roberto Clemente; and the Giants counter with some stars of their own, namely Willie Mays, Willie McCovey and Juan Marichal. Awaiting them, the Orioles have Triple Crown-winner Frank Robinson, slugger Boog Powell, and a pitching staff featuring Dave McNally, Jim Palmer, and Stu Miller. Because of the uncertainty surrounding the National League winner, who will also host the first two games of the Series, we don't even know what time the games start: noon CT if it's the Pirates, 2pm if the Giants win, and 3pm if the Dodgers come out on top. And it is the Dodgers, ultimately, who emerge from the logjam, besting the Giants by a game and a half and the Pirates by three. Little good it does, though: after Baltimore's Moe Drabowsky stops the Dodgers with 6.2 innings of one-hit, 11-strikeout relief, Orioles hurlers go on to record three straight shutouts (the final two by scores of 1-0), winning the Series in a four-game sweep. 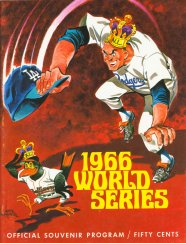 I remember this Series with great satisfaction; the Dodgers had beaten the Minnesota Twins the year before, and being a good Minnesotan who also hadn't learned how to be a discerning fan, I thirsted for revenge. The Orioles gave it to me with one of the most powerful pitching performances in Series history: two runs given up in the four games. Once again, the Series tops all other sporting events for the week, such as Saturday afternoon's college football match between Missouri and UCLA. UCLA Quarterback Gary Beban, who will win the Heisman Trophy the next season, leads the Bruins to a 9-1 season, losing only to Washington (but staying home for the bowl holidays, thanks to the conference's Rose Bowl-only rule), and they take the Tigers handily, 24-15. Sunday's NFL games are all over the map, with the Minnesota Vikings playing at home, and thus blacked out within a 75-mile radius. Channel 4, the CBS Minneapolis affiliate, offers an Eastern Division matchup between the Cleveland Browns and New York Giants; Channels 8 and 12, located in LaCrosse, Wisconsin and Mankato, Minnesota respectively, carry the Detroit Lions and the Green Bay Packers; and the two stations unaffected by the blackout, in Duluth, Minnesota and Mason City, Iowa (both Channel 3) carry the Vikings game against the Chicago Bears. It's much easier keeping track of the AFL game - the Buffalo Bills and the Kansas City Chiefs, a preview of the 1966 AFL Championship Game. In this era before Sunday football doubleheaders, there's actually some time for other sporting events, such as the Canadian Open golf championship. This tournament used to be much bigger than it is today, and the 1966 field included the sport's best: Gene Littler, Jack Nicklaus and Billy Casper. To reinforce the event's stature, a footnote in Sunday's listing mentions that in case of a tie, CBS will provide coverage of the 18-hole playoff on Monday afternoon - a playoff format once seen in all the majors, but now only the U.S. Open. Not exactly sports-related, but then you can't exactly leave off something on Tuesday called "The National Sports & Physical Fitness Test." 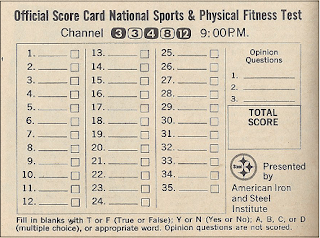 It's the latest in CBS' popular series of interactive viewer tests, which have included "The National Driver's Test" and "The National Citizenship Test." 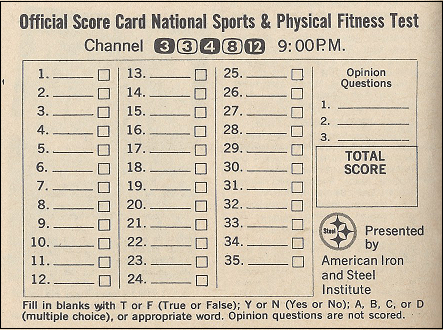 I don't have a list of the questions in front of me, only the "official score card" included in the TV Guide; however, the Close-Up promises location shoots from the Air Force Academy, "where cadets eat heartily without gaining an ounce," a New York dance studio, and a California high school with an acclaimed fitness program. Also, for no apparent reason, the program includes clips of Bobby Thomson's famous 1951 home run, and Joe Louis' first-round knockout of Max Schmeling in 1938. Harry Reasoner hosts; I wonder if this had any of the success that the other tests did? So if you don't have wall-to-wall sports on television Sunday afternoon, what the heck is on? Well, between the NFL football and Canadian Open, CBS has To Tell The Truth and Ted Mack's Original Amateur Hour; in later years the lineup would include Mister Ed. NBC featured G-E College Bowl (North Dakota State versus the winner of last week's contest between Oklahoma and the University of Scranton; the Minnesota statewide edition of TV Guide might have had an earlier go-to-print time that didn't allow them to wait until Monday), and a religion special. ABC's coverage leans more toward the affiliates; Minneapolis' Channel 9 has reruns of The Untouchables, Naked City, Thriller, Surfside 6 and The Greatest Show on Earth. Sundays were also known as the "graveyard" for public affairs and educational programming, and that's well in evidence this week. There are the venerable Sunday morning news chat shows; ABC's Issues and Answers has a debate between the candidates for governor of California, Democratic incumbent Pat Brown* and his Republican opponent, Ronald Reagan. Brown, who'd defeated Richard Nixon in 1962, had said that he looked forward to sending Reagan back to Death Valley Days, a show he'd once hosted. Presumably this was before Reagan managed to eek out a one-million vote win, garnering a mere 58% of the vote. ABC also had an interview show called Elections 66, with Vice President Hubert Humphrey and former Republican presidential candidate Barry Goldwater as the guests, and ABC Scope, their weekly Vietnam report. Face the Nation on CBS had Senate Minority Leader Everett Dirksen; the venerable Republican senator from Illinois is quizzed on the coming midterm elections. Dirksen's Democratic counterpart from Illinois, Paul Douglass, is the guest on NBC's Meet the Press (he's not listed in the TV Guide, but a quick Google search gives us the answer). There's a heavy concentration of news this particular Sunday, and per the cover story, much of it has to do with Vietnam. In addition to ABC's weekly Scope, NBC has Vietnam Weekly Review, and later that afternoon The Frank McGee Report, which often presented breaking Vietnam news. NBC also has a special report late Sunday afternoon, "The Agony of Two Cities," looking at racial conflict in Chicago and Cleveland. *Father of the past and current governor, Jerry. Channel 11, the Twin Cities' independent station, presents the long-lost standby of the local channel, matinee movies, which in this case is a prime choice indeed: the Academy Award-winning Casablanca, followed by Basil Rathbone's Sherlock Holmes in The Voice of Terror. Reruns of Laramie and Sea Hunt and a religion show round out the afternoon. I talked a little a couple of weeks ago about the frustrations that writers had working with the Production Code, that arbiter of content that governed how certain moral issues should be presented. Well, that was in 1965, and now one year later TV Guide takes on the question of what should be done to produce a movie code that "makes sense in view of contemporary standards." The Editors' conclusion: "It isn't easy." *A fact that must drive Gene Roddenberry and Sterling Silliphant to drink. *From what we know now, neither, apparently, was Rock. The answer, according to the Editors, is that the movie code shouldn't worry about television and concentrate on theaters only. Most movies, they point out, can be adapted to run on television*, and the ones that can't will probably recoup any advertising losses through European distribution. "The important thing is that such a code, run by administrators empowered to interpret its provisions, will make it possible for creative men to treat any subject tastefully." *Which in itself was the source of no little controversy.